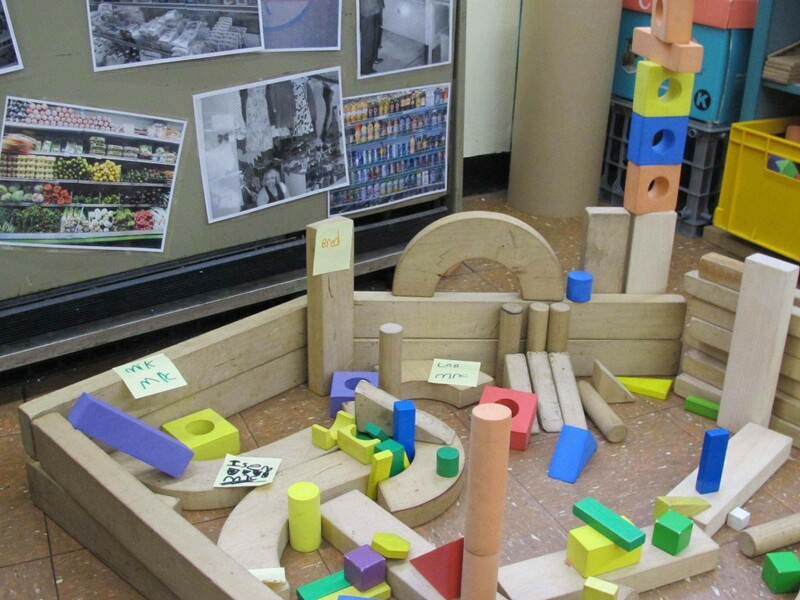 When I decided to call my blog Investigating Choice Time: Inquiry, Exploration, and Play, I purposefully put forth my vision for the meaning and direction of Choice Time by using those three key words: Inquiry, Exploration, and Play. On a first visit to a school, I always ask to spend time in rooms during Choice Time. To my dismay, what teachers often refer to as Choice Time is actually an end-of-day wind down time for children after a morning and afternoon spent in reading, writing, phonics, and math lessons. This Choice Time might consist of board games, legos, table toys and, if the children are lucky, dramatic play and (not so often) blocks. There’s very little planning for these centers. It is usually a free playtime, a throwaway half hour at the end of the day before dismissal, giving the teacher time to grade papers, prepare homework, conduct a reading or math assessment, or do some other type of paperwork. I rarely see teachers interacting with children or writing down observational notes during this Choice Time. I have a different vision of Choice Time. Because it is so important, it should be scheduled at a prime time during the school day, allotted a full period (perhaps even a bit more) and carefully planned for by the teacher. I’m not suggesting that centers should consist of task-driven activities. Quite the contrary, I think that they should be open-ended enough to allow for much exploration, discovery, collaboration and creativity. The teacher should be able to explain very specifically to another adult – an administrator, a parent, and a colleague – the important learning that is taking place as children are exploring playfully. Let me explain a bit about the preparation for my vision of Choice Time centers. When I present the concept of an inquiry-based and exploratory Choice Time to teachers, I introduce them to a simple planning template. This template is divided into three sections. I’ll attempt to explain how the planning is done. 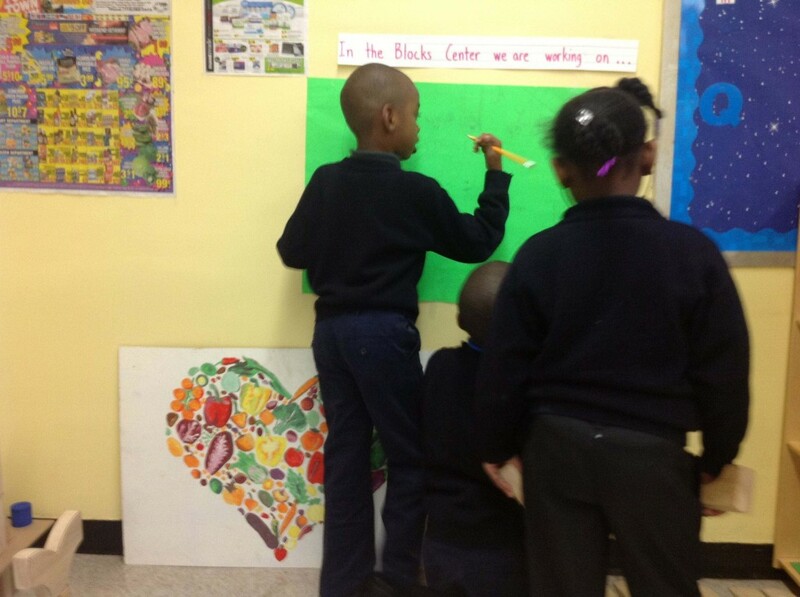 We begin with the initial setting up of a center and describe the instructional rationale behind this center. For example, at the start of the year the instructional rationale for the block center might be to encourage children to collaborate and share, to give them opportunities to discover the unit blocks different sizes and shapes, and for children to gain an understanding of three-dimensionality. Later in the year, the instructional rationale might include providing opportunities for children to write signs for constructions using their knowledge of phonics, the word wall and words. If the teacher has a strong understanding of the learning that is taking place at each center, it’s so much easier explaining this learning to administrators, particularly if they question why prime time during the school day is being used for play. Most administrators, it seems to me, have very little knowledge about early childhood and theories of child development. Parents also often need reassurance about the learning taking place while their child is engaged in important, playful, age-appropriate work during Choice Time. This can be at the art table, dramatic play, and the block center or at a science center. Are there appropriate books in each center for children to look through for new information, ideas and inspiration? Are there a variety of writing materials for recording new, surprising information, writing notes, making signs, etc? When I arranged my classroom, I incorporated the tables and chairs into the different centers. For example, in the art center I had two tables that abutted each other, creating a larger area for art projects. A table was in the science center and one in the math center. My goal was to give the message that our room was an art studio, a science lab, a math lab, a library, and a construction/architectural site. It was a big lab for learning and creating. The space in the room was broken up in a more interesting design than if all of the tables were together in the middle of the room. This seemed to work well for me. After the room and materials are set up and instructional goals are clear, it is time to observe how children use the centers. Therefore, the second part of the template focuses on Assessing the Center. This is done after the children have been using the center for about two or three weeks. We now ask our selves: How are the children using the materials in this center? Sometimes the materials that we put out are not open-ended enough and children quickly tire of them. Sometimes they are too open-ended and they are not being used constructively. Writing down some observations during center time can be very helpful for assessment. After assessing how the children are using the centers and the materials in the centers, it’s time to do some Reflecting and Planning Based on these Reflections. In this section of the planning template, we ask ourselves: What materials can be added (or removed) to support growth in this center? One year I noticed that the children were losing interest in the science center. They had been exploring with all different types of magnets. Some of the children were particularly interested in mazes. I provided paper, paper clips, pencils and magnets and challenged them to create maze games. They were totally engrossed in using the magnets to pull the paper clips around their mazes. This interest lasted about a week or so but I noticed that it was ebbing. I remembered that my daughter had a magnetic storybook theater when she was younger and began to rummage around at home to see if I could find it. Success! I brought this wonderfully magical-looking theater into school to share with the class and, as I anticipated, the children were enthralled. I wondered, out loud, if we could use shoeboxes and our magnets to create our own storybook theaters. My wondering caught fire. What happened next was a combining of the science center and the art center. Some children found their favorite storybooks and looked through them for ideas as they built their theater scenery. Other children created original stories and scenes or made a scene from their own life. As they drew and cut out characters I demonstrated how to fold the bottom and glue on a paper clip so that the figure could stand upright and be moved around the shoebox surface. Some children glued two clips on to make it easier for the magnet to move the character around the stage. They had to hold their shoebox stages so that they could move the magnet around under them but one child came up with an ingenious solution. He found four empty sewing spools that were in a container full of spools in the art center and he glued (tape had to be added later on!) one on each corner of the shoebox, creating a stand. He placed the shoebox on the table and swiped a wand stick magnet under the box to move his “people” around the stage. Another question to consider is: Are there any ways that you can connect work and explorations in this center to classroom studies and inquiries? As an example, if you are in the midst of a whole-class folktale study and this week you’re focusing on Goldilocks and the Three Bears, the addition of the storybook and some stuffed bears in the block center can provoke children to construct the forest and the house of the bears. They may use the book and props to start reenacting the story and this is without being given any specific task. A second grade class that I’ve been working with has been doing a Car Study. 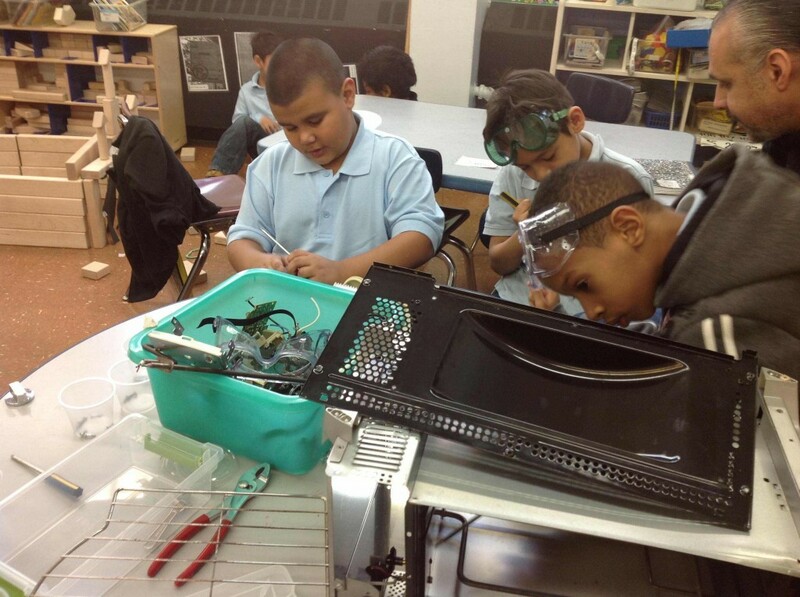 After visiting a garage and interviewing a mechanic they opened a “take apart” center where children were using tools to take apart an old machine. They also had a map center filled with all different road maps and materials for children to create their own maps. Recycled materials were stocked in the art center for creating cars. It may seem somewhat overwhelming to plan out each center using this template and it probably will not be used all of the time. However, there’s so little support that teachers today get in understanding how to develop an exciting, enriched, playful and also challenging Choice Time. I was very lucky. I had so many mentors who taught me about the importance of play my journey as a teacher. I fear that, for new teachers, there are no mentors in their schools who can help them understand how to create exploratory, inquiry-based centers in their classrooms. Hopefully, this planning template will, if not take the place of a mentor, at least give teachers some support. This entry was posted in Investigating Choice Time: Inquiry, Exploration, and Play and tagged Car Study, folktale study, mentors on January 20, 2014 by Renee. I agree that play is out of fashion right now, but I am also alongside you advocating for it at every turn. I will pass this along to many of the teachers I work with. Play with intention! Thanks for writing!! Loved the poem you left on my blog! It took me several years to develop a ‘planning form’ to use for Emergent Curriculum…..I wanted something that was based on observations and responses and reflections, on a day to day basis. The result was simple and sounds very much like yours…..it creates a spiral from day to day. It is in an appendix in my book Unscripted: Emergent Curriculum in action. We think alike!! Thank you Susan! I’ll look for your book. Who is the publisher? I like forms that are practical (not busy work),easy for teachers and instructionally informative. I’d love to share yours with the teachers I work with.